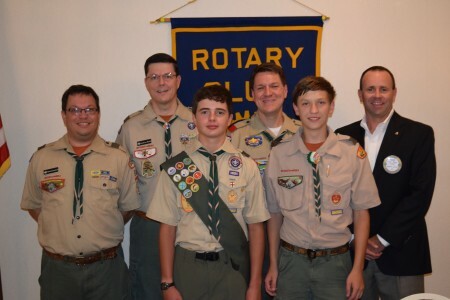 Scouts and leaders from Boy Scout Troop 50, chartered by the Auburn Rotary Club, provided Rotarians with an annual update on the troop’s activities and success. The troop now numbers nearly 30 Scouts and includes two Scouts who earned the Eagle Scout rank in 2014, and five more who potentially will earn Scouting’s highest rank in the next 12 months. The troop’s presentation included: (left to right) Rob Stanford, troop committee chair; Andrew Baird, scoutmaster; Louie Harris, senior patrol leader; Michael Tullier, chartered organization representative and Auburn Rotary Club president-elect; and Andrew Stanford, immediate past senior patrol leader. They are pictured with Club President Brad Wilson (right). The troop meets most Monday evenings during the school year at First Presbyterian Church in Auburn. For more information and links to the troop’s calendar and blog, visit boyscout50.org.